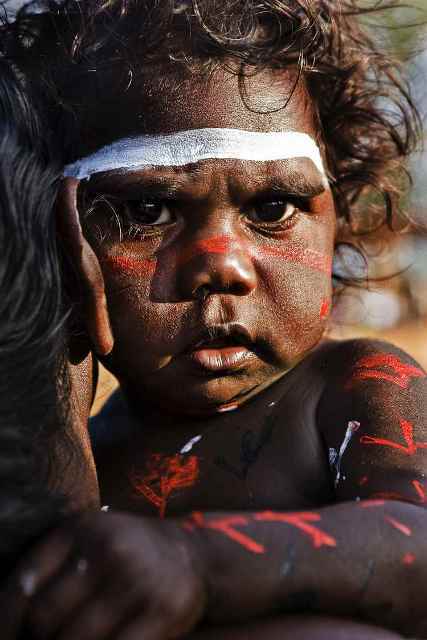 This image of a young Yolngu child in his mothers arms was captured on my second assignment shooting for the Yothu Yindi Foundation (YYF) in 2008. I was the official photographer of the Garma Festival, a celebration of Yolngu culture, in far North Eastern Arnhemland, Australia. I first attended Garma in 2007 as my prize for winning the World Nomads Travel Photography Award, (an international photographic award open to student photographers), and I have been blessed to be invited back every year since, to continue my work in supporting the YYF’s effort to preserve and nurture Yolngu culture. Garma is always the highlight of my year, a profound experience, and I look forward to returning to my second home later this year. It’s such an awesome assignment, having the freedom to freely shoot the most beautiful people, at the best festival I’ve experienced so far, from the evening bunguls (traditional dancing), to intimate portraits, as well as the every day happenings at the festival. As an official photographer of the YYF, I am given access to dances and areas that are off-bounds to other photographers – and this is exciting! To gain the trust and admiration of a group of people who are very sensitive to having their photo taken, has been a huge learning experience – about in knowing what’s appropriate and where the boundaries are. Since 2007 I’ve been working on my own project focusing on the “Children of Arnhemland” through portraits of the children with faces painted. According to a UN report, many of the Aboriginal people of Australia live in below third world conditions – so my series looks to the children, the future generation of leaders, in the hope that they will bring lasting change to their communities. Cameron Herweynen is a travel and commercial documentary photographer who belongs to The WideAngle photographer’s network. For more images by The WideAngle photographers, please click here. Want tips on how to shoot better portraits? Take a look here.